– Alat ini sangat berfunsi sekali, dari jack audio 3,5 bisa memancarkan bluetooth Receiver kesemua (Tablet- HP- PC- PSP – DLL).jadi mendengarkan audio tanpa harus lewat CD – Flash Disk – DLL . Hanya dengan GADGET sudah mengeluarkan suara dispeaker yg kamu suka. Let ordinary speakers instantly become wireless Bluetooth stereo audio music speakers Can be paired to any Bluetooth enabled devices, such as mobile phone, laptops, speaker and Bluetooth audio transmitter. 1. 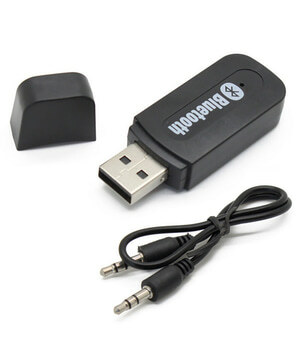 Connect it to the USB output of your PC or laptop. 2. At the same time, connect it to your speaker with the 3.5mm audio cable. 3. 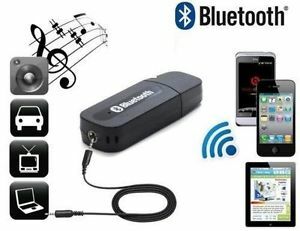 Run the Bluetooth function of your phone or iPad. then pair with this adapter. 4. Then you may enjoy the music on the speaker from your phone or iPad.